The changing market dynamics creates the need for adopting new technologies and optimizing the existing ones in order to stay ahead of the competition. The growing complexity in the organizational IT infrastructure often poses new challenges that affect productivity, availability, and agility, giving rise to the need for a more focused approach toward aligning IT with business goals. 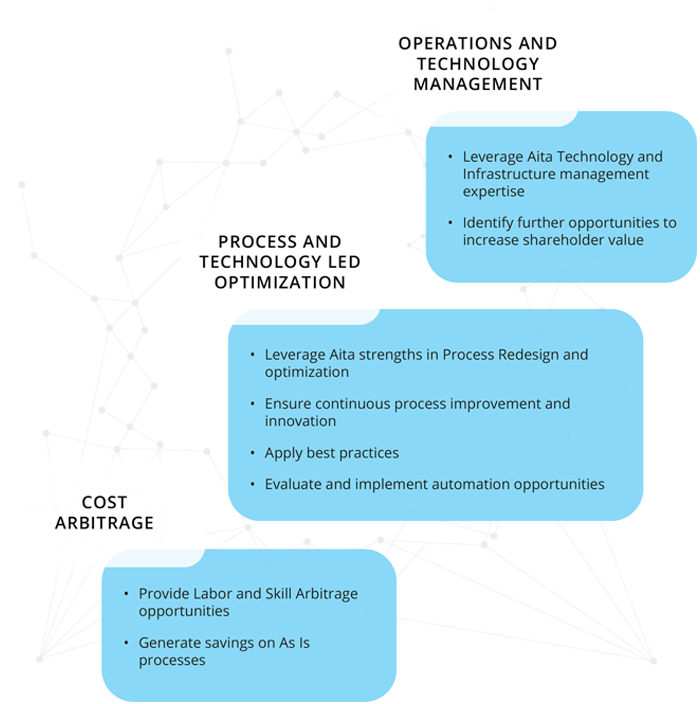 AITACS Infrastructure Managed Services team provides a comprehensive portfolio of services in managing and optimizing IT infrastructure by adopting best practices, thereby reducing cost and improving service levels and quality. We help create strategic differentiation and operational superiority by managing your Data Center Infrastructure in a manner that provides business value. We ensure that clients experience higher availability of their IT infrastructure and data center assets and reduced downtimes on their mission-critical applications. Our GDC helps reduce TCO to the tune of 20% - 35%, by cutting operational costs. Our proactive monitoring of key performance criteria and de-risked service delivery model ensure that problems are spotted ahead of time and that operations are robust. We provide an Infrastructure-element-based pricing model that can be customized to deliver at different price points. We help clients reduce investments through our Managed Services framework. We deliver enhanced service levels through best practices based on Information Technology Infrastructure Library (ITIL) ISO 27001, and Microsoft Open Framework (MOF).